That's really interesting, thanks. The majority of patients are either mildly or moderately ill. It doesn't say how large of a sample each treatment represents (for example only 10 people might have tried one, limiting the usefulness of the of the response.) LP and provigil had the highest percentage of "greatly improved" followed by the Perrin technique (whatever that is) and pacing, but none of them outdid standard placebo effect. GET had those most "much worse" followed by physiotherapy, hydrotherapy and LP. A lot of the common supplements and mind/body stuff had mostly "no change" responses, and imunovir looks like a big dud. When "greatly improved" and "improved" are added together, pacing seems to be the most helpful which is unsurprising. Its an osteopathic treatment which also incorporates daily massage, named after the UK osteopath who devised the treatment - I would say I would put myself in the unchanged cetegory after this treatment BUT class myself as severely affected not mild or moderate. I've been on this for just over 3 years wih slow steady gradual improvement, and was severely affected when I started. It doesn't say how large of a sample each treatment represents (for example only 10 people might have tried one, limiting the usefulness of the of the response.) LP and provigil had the highest percentage of "greatly improved" followed by the Perrin technique (whatever that is) and pacing, but none of them outdid standard placebo effect. GET had those most "much worse" followed by physiotherapy, hydrotherapy and LP. When "greatly improved" and "improved" are added together, pacing seems to be the most helpful which is unsurprising. I hope the MEA realise that the most severely affected cannot respond to surveys. The big point for me is just that Weasly and Nijmegen continue to tell us that CBT/GET works, and it works for most patients (and are publishing studies about it) , while independent surveys show that it makes most people worse, just the opposite of what they tell us. like I said, its like your life, money, status and career is 100% about selling apples to people, and you yourself are doing a study about if selling apples might be bad for human health...whats the value of let someone study/judge his own work???? "For example, the results of a recent survey conducted by the ME Association showed that of the 906 individuals who had received GET, 33.1% felt much worse and 23.4% judged themselves to be slightly worse (4)." 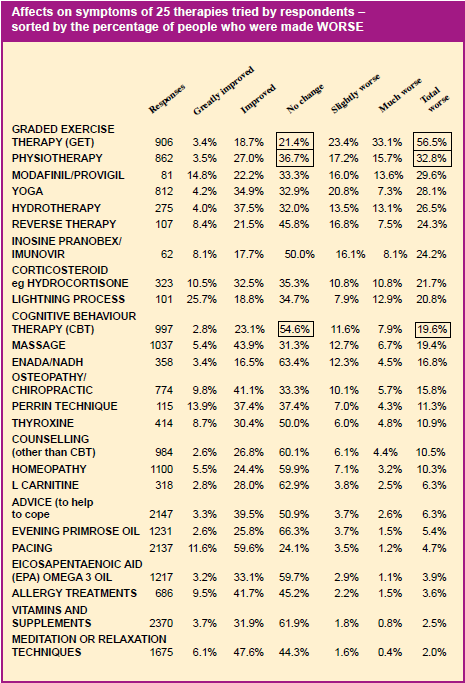 The first column on the chart for each treatment, called 'responses' shows how many people replied for each treatment. OK, I totally missed that. My brain must have gone on vacation or something. D'oh! Yeah, provigil was equally worse and improved, if you add up the greatly + improved, and slightly worse + much worse, it come out to roughly 36% and 33%, respectively. And about the same for no change. Yeah, I agree. But they would probably dismiss a patient group survey as biased or something. This big point for me was that nothing consistently offers a significant improvement, apparently. Also, doctors are diagnosing people with ME/CFS for whom morning exhaustion (7%) and PEM (9%) are minor problems! If anyone is curious of how to test something like that statistically, the normal test would be a chi-squared test. My argument would be that adverse reactions are important wherever they are observed. You don't need to have that many adverse reactions to a drug for warnings to be issued or sometimes it can be taken off the market. Really glad you were helped, thats excellent - i did like Ray but it did nothing for me. I agree with Tomk here. Patient groups survey are published in the medical literature where other medical conditions are concerned and non-CFS patient advocacy groups use such surveys to give scientists, legislators, government officials information about their illnesses. One of my pet peeves has been that this data about the adverse effects of GET have not been publicized to healthcare staff. We need to get away from the notion that only something official from people with many initials after their name published in Lancet, Science, etc. is valuable. Now, these factors INCREASE the chances that it is (having passed peer review, etc.) but value should not be given simply because of these factors without evaluating reality. (Similarly, it would be wrong for alternative medicine practitioners to dismiss all published mainstream sources out of hand.) Instead, each study must be judged individually. This is how we got into trouble in the first place with CFS. All data has biases, all studies are imperfect but it's how you deal with the strengths and limitations of the data that help you get closer to the truth. As did Dr Esther Crawley in response to the joint patient survey carried out in 2008 by Action for M.E. and AYME. So if Dr Crawley should ever quote this survey in relation to Lightning Process, she will be quoting from a survey which she has already denounced as being "unreliable". Min has raised the very valid concern that the severely affected may be underrepresented as they may not be well enough to complete an online Monkey Survey and may not have anyone who could act as amanuensis for completing the paper questionnaire, either. are those who have had negative experiences of treatments more motivated to complete a survey than those who have had more positive outcomes; also, those who have recovered following treatments or without treatment may no longer visit the MEA's website or maintain their membership of the ME Association and would not have received a copy of the survey. Action for M.E. has been looking for volunteers with M.E., who have experience of graded exercise therapy (GET), graded activity therapy (GAT) or exercise on prescription, to comment on our draft questionnaire, as reported in our news item of 21 May. The deadline for comments is 18 June. Please note that the final survey will be launched 1 July and it will close 1 September, rather than in August as previously stated. For further information please contact our Policy Officer, Tristana Rodriguez (email address on site). Have you tried GET, GAT or exercise on prescription? We are looking for volunteers with M.E., who have experience of graded exercise therapy (GET), graded activity therapy (GAT) or exercise on prescription, to comment on our draft survey. The aim at this stage is not to complete the survey, but to identify any mistakes, omissions or other problems, before we launch the survey online and in final printed format. The deadline for comments is 18 June. The final survey will be launched in July. “We would like to follow up on our 2008 Health and Welfare survey by further investigating the experiences of people who have tried the physical rehabilitation therapies, GET, GAT or exercise on prescription. “The results of this survey will inform our response to the PACE trial, expected this autumn and any subsequent review of the NICE guideline. ”If you have experienced GET, GAT or exercise on prescription but are not able to comment on the survey at this time, I hope you will complete the questionnaire when it goes live in August. Once you have read the survey, please send any comments to our Policy Officer, Tristana Rodriguez .